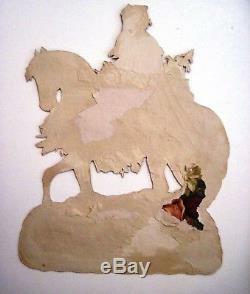 Very Rare Vintage Christmas Die Cut is of Santa Riding a White Horse carrying Tree & Toys. 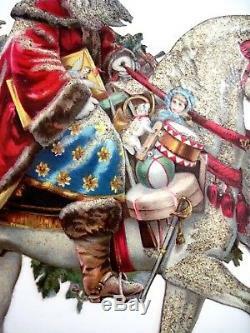 Santa is wearing a gorgeous red coat and hat with holly on it. The horse has red bridle. 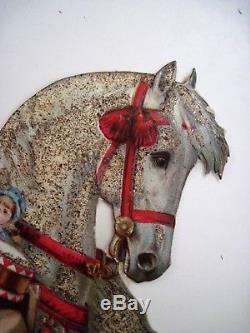 There is gold glitter all over the front of horse and Santa's beard and the snow on the ground. This die cut is stunning. Previously pasted into a scrapbook. Business cards, ribbons, literary excerpts, and eventually. Were all preserved on the pages of these memory books. In response to the scrap booking trend, 19th-century bookmakers designed blank albums with elaborate, tooled-leather covers, gilt paper edgings, and engraved clasps. The earliest materials explicitly produced as die-cut scrap for decorating homemade albums were black-and-white, hand-colored etchings. As lithography processes improved, bright colors, textured embossing, and glossy finishes were employed to enhance the printed imagery. Had become the leaders in such scrap production. 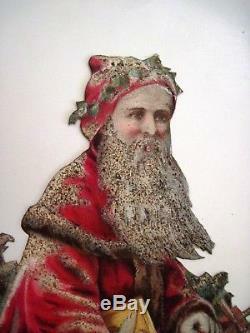 Successful companies like Currier & Ives and Raphael Tuck & Sons created beautiful scrap pieces alongside smaller brands like Allen & Ginter and Littauer & Boysen. But the German die cuts are considered the best because of the details of their tooling process. Measures: 7-1/2" W x 10-1/4" H. Nd edges are slightly worn. 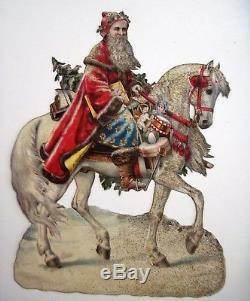 The item "Very Rare Large Vintage Christmas Die Cut Santa Riding a White Horse" is in sale since Wednesday, November 28, 2018. This item is in the category "Crafts\Scrapbooking & Paper Crafts\Scrapbooking\Scrapbooking Embellishments\Die Cut Shapes & Punchies". The seller is "bungalowblondie2" and is located in San Diego, California. This item can be shipped worldwide.